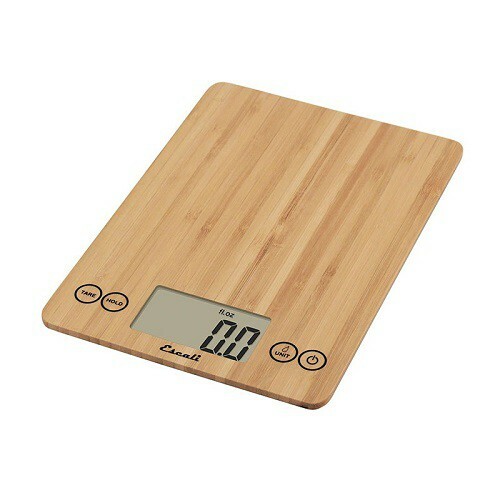 The Arti Bamboo Kitchen Scale has a gorgeous bamboo surface that is all natural and environmentally friendly. This unique scale is one of the most popular Escali scales available and is capable of measuring both liquid and dry ingredients. With an astounding weight capacity of 15 pounds, this reliable, durable kitchen scale has an easy-to-read oversized display and touch sensitive controls. The Arti Bamboo Kitchen Scale has several features that make the scale easy to use in a variety of settings. The hold feature retains the weight measurements on the screen after the item has been removed from the scale. Another cool feature is the tare button that allows users to multiply the weight of items or subtract the weight of the container from the overall measurement. An automatic shut-off feature preserves the battery life by turning the scale off after three minutes of inactivity. You will love the convenience of this versatile and durable kitchen scale.